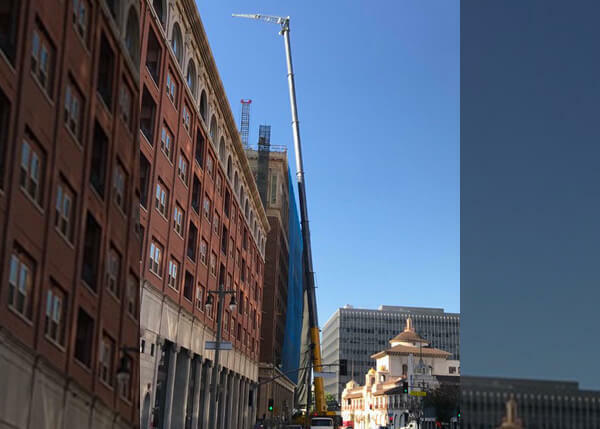 This lift job at the Hall of Justice in Los Angeles, CA, features our 120 Ton TM9120 Grove lifting and maneuvering materials through upper windows during a renovation project. This construction job in Los Angeles, CA shows our T340XL 40 Ton Terex removing form panels from concrete pour at J.T. Wimsatt. 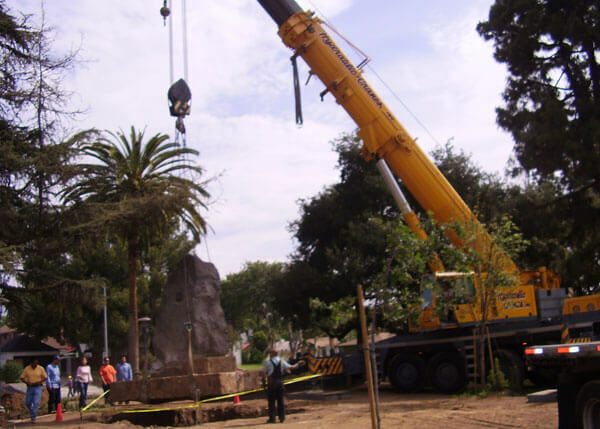 We used our LTM 1160/2 200 Ton Liebherr hydraulic crane to set a rock monument at Veterans Memorial Park in Rosemead, CA. 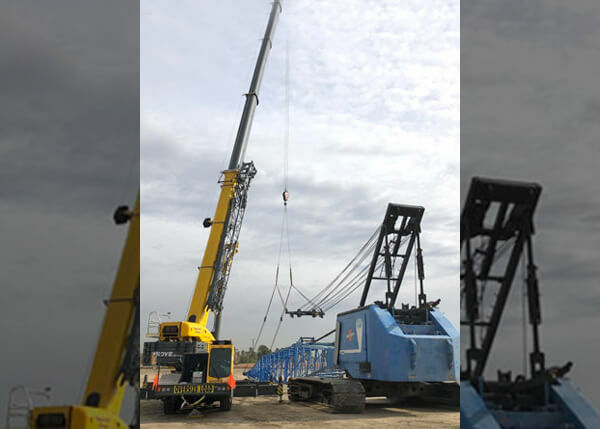 Using a two crane pick, we were able to use two T 340XL 40 Ton Terex hydraulic cranes to load equipment at this lift job in Santa Fe Springs, CA. 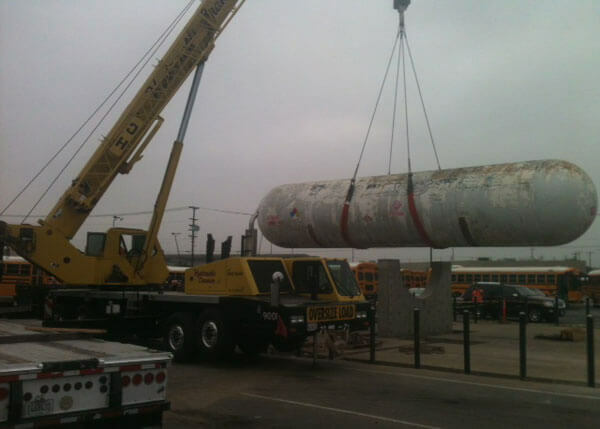 This lift job in Irwindale, CA required us to use our HTC8690 90 Ton Link-Belt to load an empty oxygen tank onto a trailer. 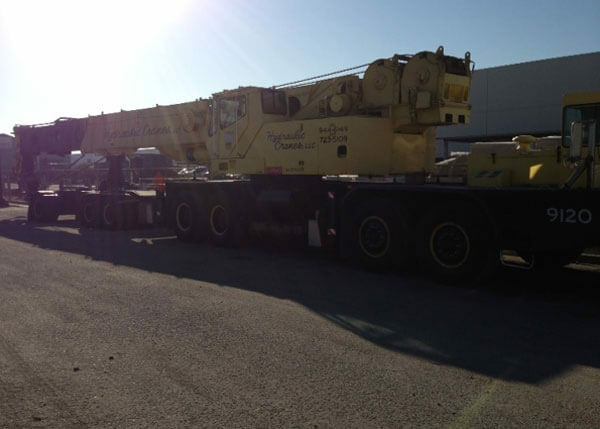 This is our LTM 1160/2 200 Ton Liebherr arriving on site at Disneyland in Anaheim, CA. 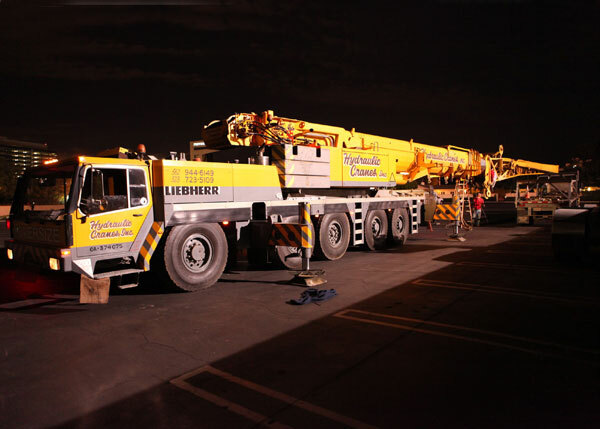 Before we begin any lift, our crane operators properly prepare set-up to ensure safety. 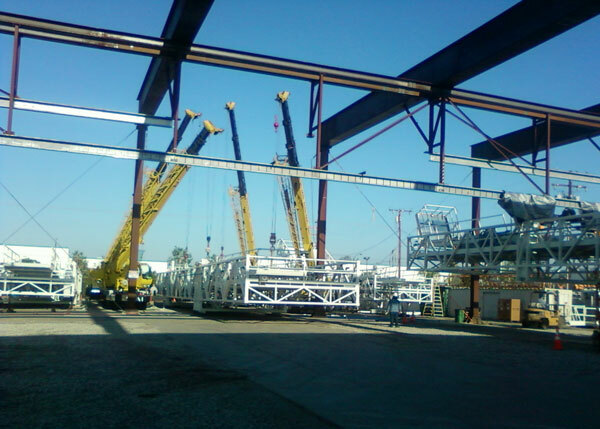 This is a 200 ton crane setting structural steel in Fountain Valley, CA. 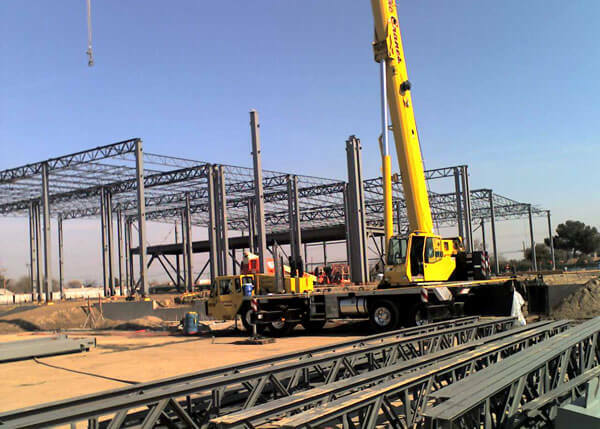 Hydraulic Cranes LLC completed this service for Allied Steel safely and efficiently. 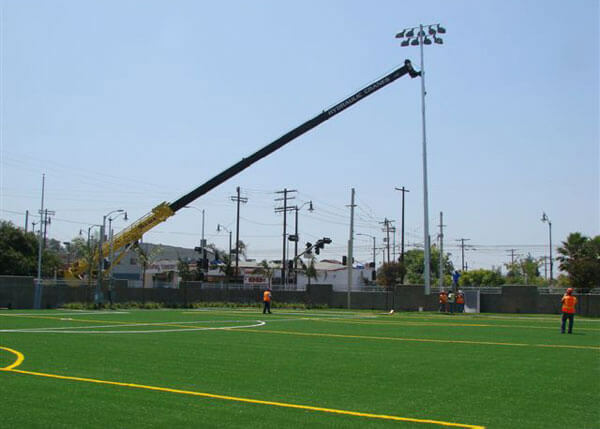 Using our HTC 8690 90 Ton Link-Belt, we were able to lift and set light poles without driving onto the playing surface of this field in Montebello, CA. 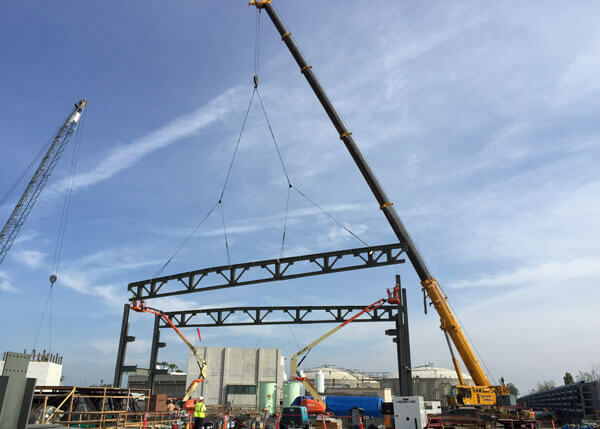 This construction job in Rancho Cucamonga, CA required us to use our HTC 8490 90 Ton Link-Belt to erect a steel building at Adams Iron. 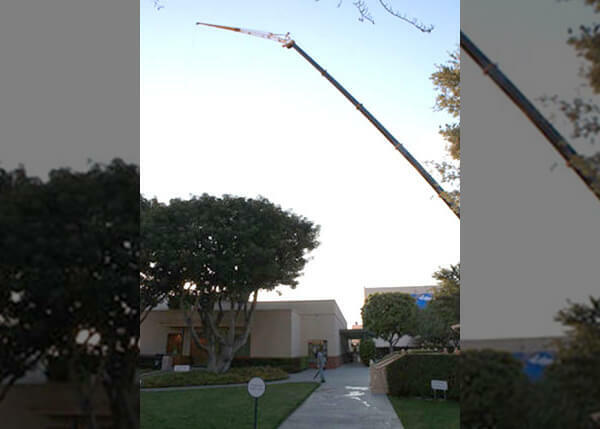 This lift job in Orange, CA features two T340XL 40 Ton Terex hydraulic cranes using a 2 crane pick to hold a canopy up in order to raise the height of a service station. 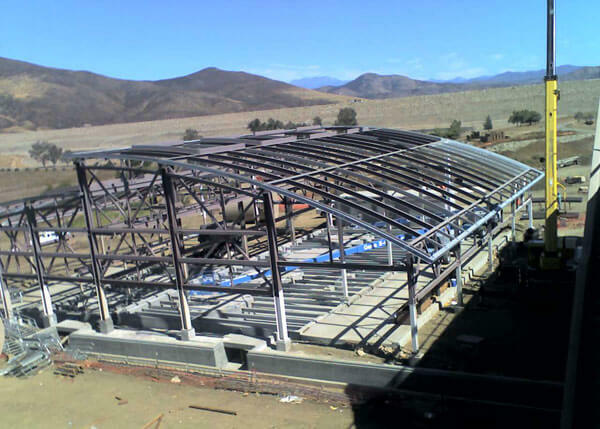 This construction job in Sylmar, CA shows our LTM 9120 120 Ton Grove setting concrete forms on this building. 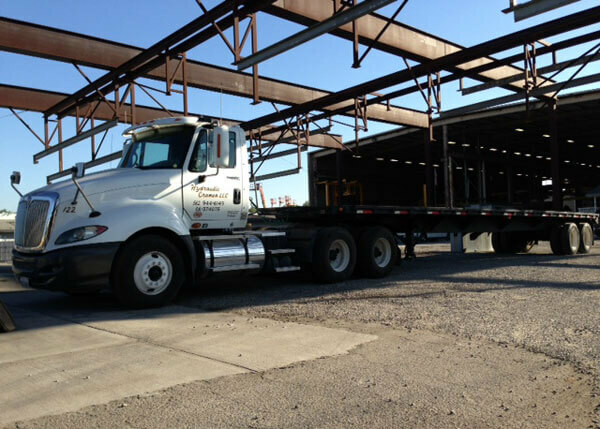 This International tractor and 45 ft flatbed trailer is used to carry crane accessories from our Santa Fe Springs, CA yard site to customers’ properties. After this photo was taken, crane counter weights were loaded. 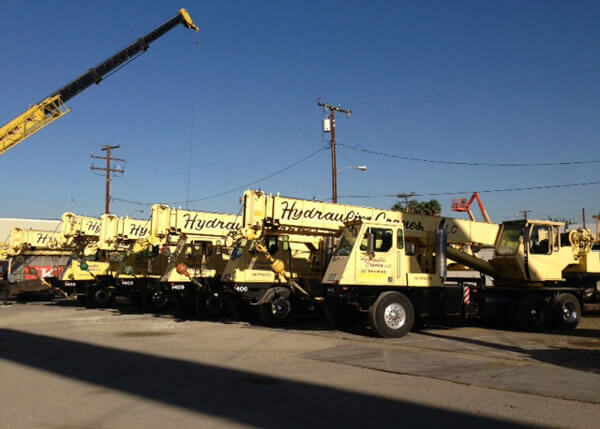 This photo of MDH350D 35 Ton Lorain hydraulic cranes was taken at our yard in Santa Fe Springs, CA. These cranes were waiting to leave for night K-Rail jobs on the freeway. 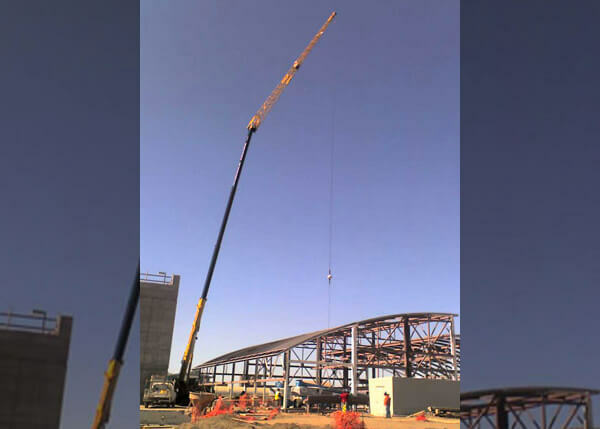 This construction job in Fresno, CA features our HTC 8690 90 Ton Link-Belt erecting a steel building. 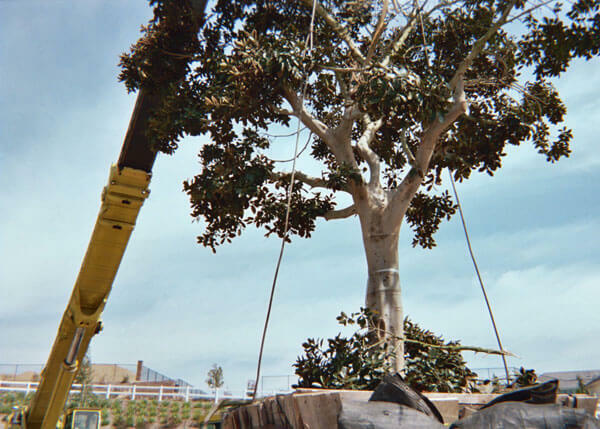 This landscaping project at Senna Tree in Sierra Madre, CA features our TM 9120 120 Ton Grove planting a full grown 12ft. boxed tree. 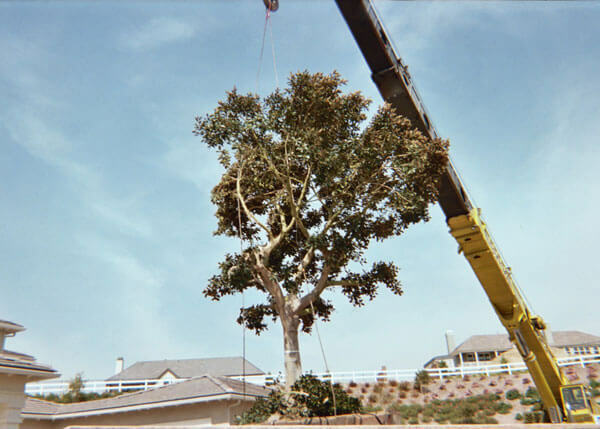 Using our TM 9120 120 Ton Grove hydraulic crane, we were able to plant this 12 ft. boxed tree at Senna Tree in Sierra Madre, CA. 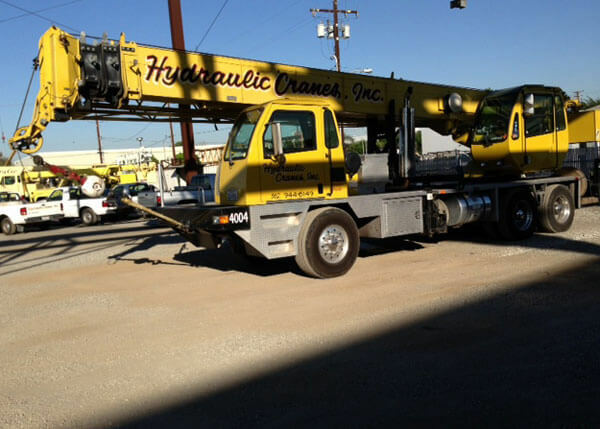 We regularly maintain our equipment at our yard in Santa Fe Springs, CA. This 40 Ton T340XL Terex is getting serviced by our full-time mechanics after returning from a two week job. Safety is our priority. Before heading out to his morning job, one of our crane operators performs a pre-check on this TM9120 Grove at our yard in Santa Fe Springs, CA. This LTM 1160/2 200 Ton Liebherr hydraulic crane is setting a skylight frame in the middle of this building during this lift job in La Vern, CA. 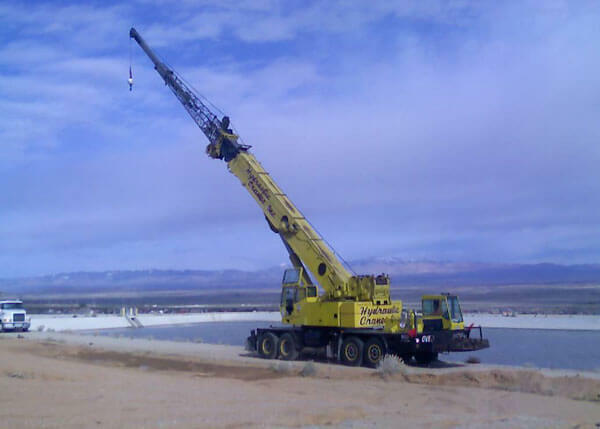 Using our TM9120 120 Ton Grove hydraulic crane, we replaced pumps out of the middle of this reservoir in Desert Center, CA. 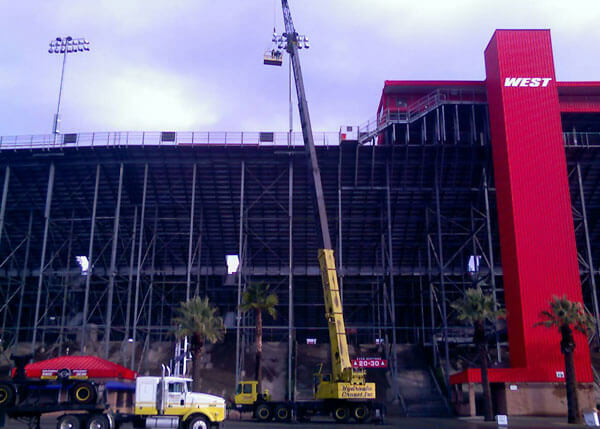 This electrical job at the Auto Club Speedway in Fontana, CA shows our TM9120 Grove assisting with light pole installation and maintenance. 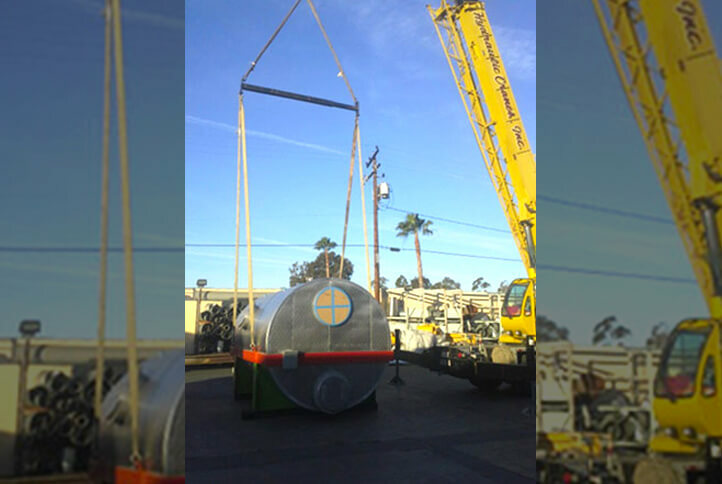 We used our one of our seven Terex 40 ton T340-XL cranes to hoist this tank in Irwindale, Ca. 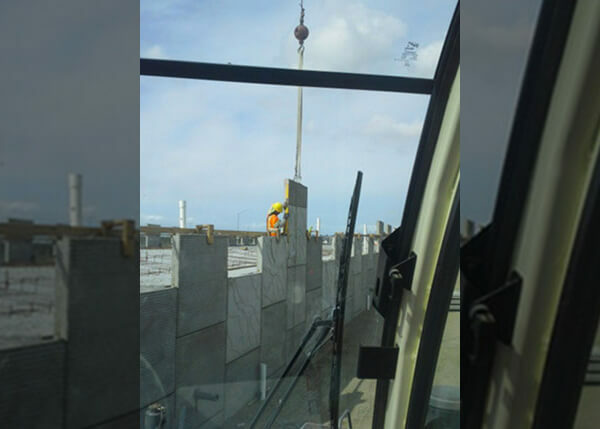 This construction job in Los Angeles off the 10 freeway features our 40 ton Terex T340-XL crane, which we used to install new concrete freeway wall panels. 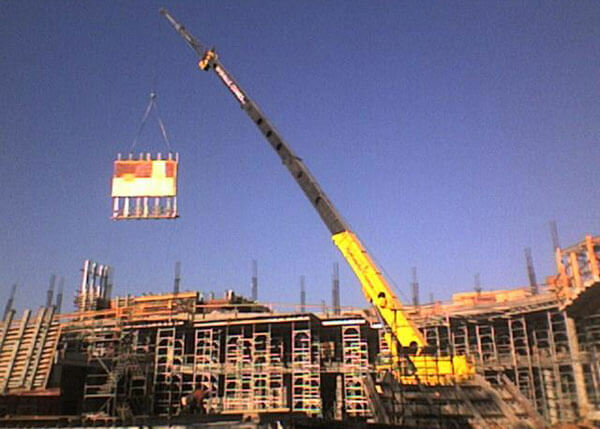 This AC Unit installation in Tustin was completed using our Link Belt HTC-8690 crane. 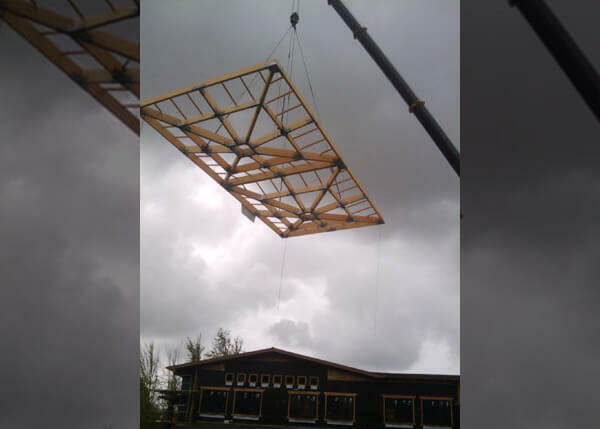 It easily and safely reaches over neighboring buildings. 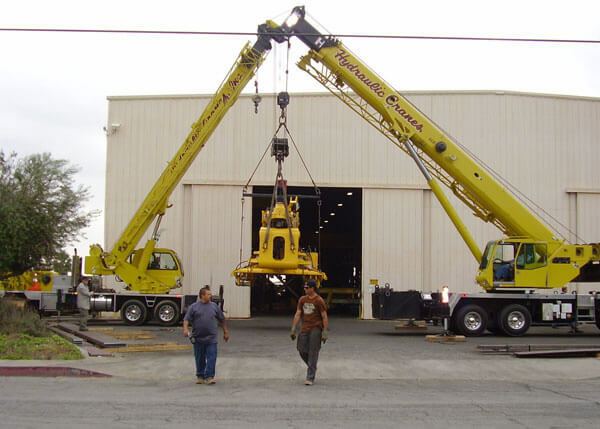 We used our 115 ton Grove TMS 9000-2 to assemble this Manitowoc conventional crane. 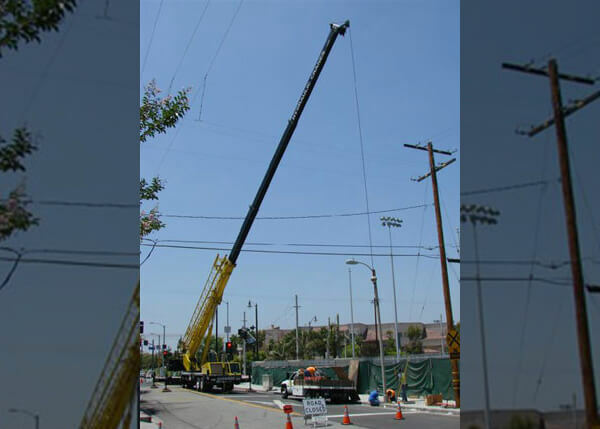 We offer mobile crane rental services for Los Angeles and Orange County. Our new 115 ton Grove crane pairs up with our reliable workhorse 120 ton Grove crane to set heavy vaults for a construction job. 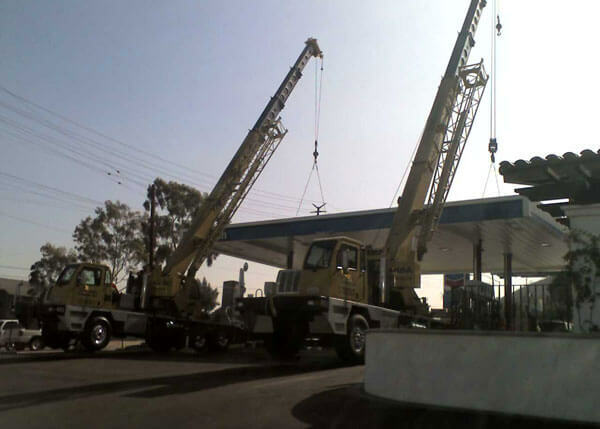 We are Southern California’s best source for mobile cranes. 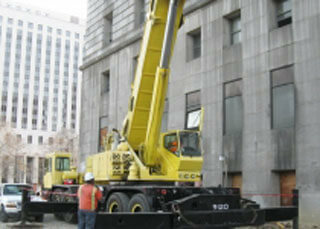 We used our 300 ton Grove GMK5250L to erect steel on this construction job in downtown LA. This photo shows off all 230 feet of the crane’s main boom, as well as its 70 foot luffing jib. 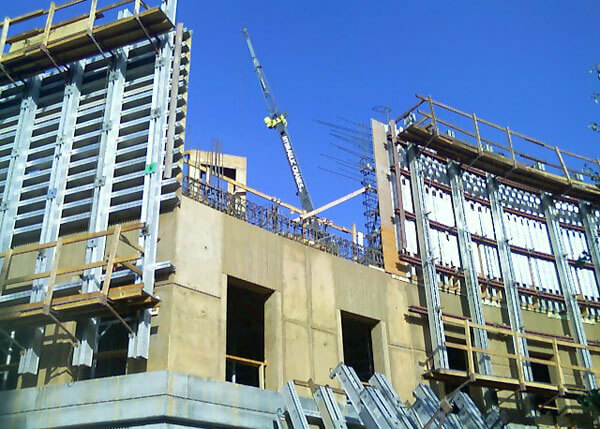 This lift job in Long Beach used the Grove TMS 9000-2 to easily hoist package units onto a new apartment building. 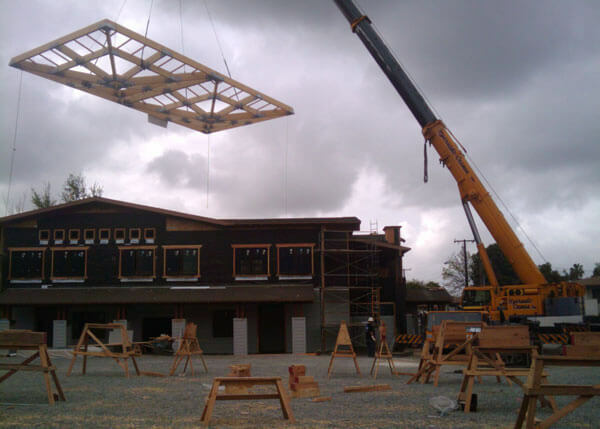 This lift job in La Verne, CA required us to use our LTM 1160/2 200 Ton Liebherr hydraulic crane to maneuver and set a skylight frame into the center of the building. 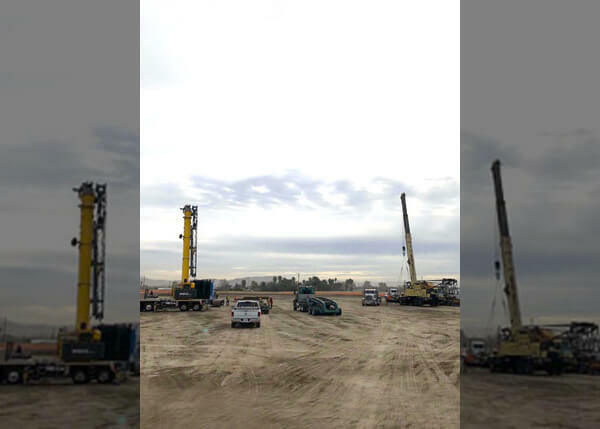 We used our HTC 8690 90 Ton Link-Belt hydraulic crane to erect this steel building two-week construction job in Fresno, CA. 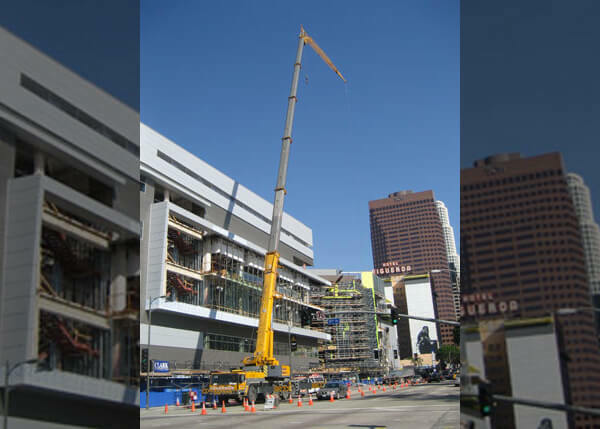 This installation job at the Nokia Center in Los Angeles, CA features our LTM1160/2 200 Ton Liebherr installing cat-walks inside the building. 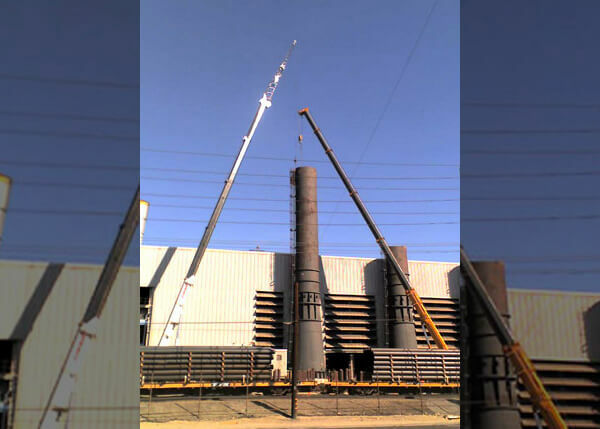 This plant shutdown in Riverside, CA shows our T340XL 40 Ton Terex hydraulic cranes dismantling vintage steel burners, piece by piece. 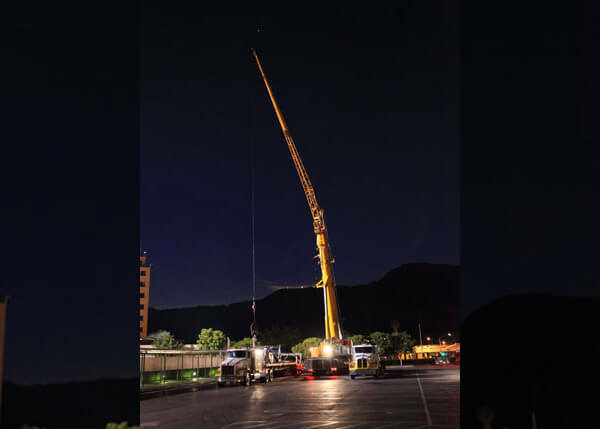 This electrical job in Moreno Valley, CA features our T340XL 40 Ton Terex hydraulic crane setting light poles. 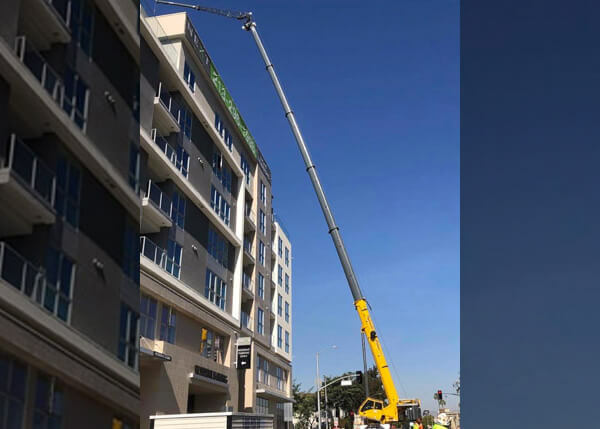 This construction job in Anaheim, CA features our LTM 1160/2 200 Ton Liebherr hydraulic crane completing work on a new hotel at the Disneyland theme park.